For those of you who didn’t wake up to see Phil Mickelson on The Golf Channel’s “Morning Drive,” or tape it on Friday, as I did, here’s a review of the last 10 minutes, where Phil provided his insight about short-game basics. For many of you, this will be Short Game 101 or even Golf 10, but he echoes something I see often that people don’t seem to factor into their short games: weight shift. So, here it is, Phil telling it like it is in response to a question about one tip he’d give amateurs. “You’ve got to have your weight on your front foot. If you chip with your weight back, the leading edge (of the club) is coming up, and most people chip with their weight level or back, which is just terrible. After weight shift, Phil discussed stance to bring it home. One thing that I left the Academy with is a competence to teach the short game. They teach a system that applies to every short-game scenario and uses a universal stroke. You just change clubs to fit the shot/distance. The one thing people seem to constantly need to be reminded of, until it’s ingrained, is the weight shift. It doesn’t work without it. 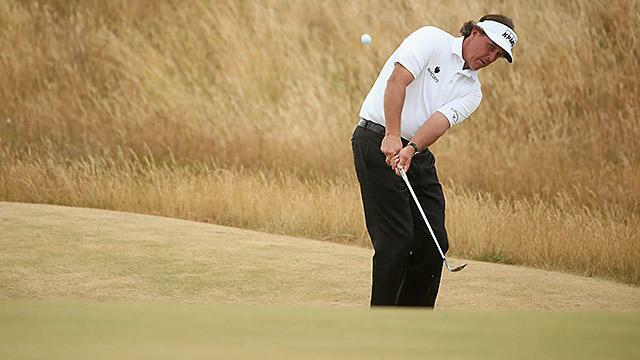 Anyway, as an ending aside, if you’ve never watched one of Phil’s short-game videos, hunt one down. It’s mesmerizing stuff, especially the trick shots, which show you the mind-bending possibilities for this wonderful game. This entry was tagged Golf Channel, Morning Drive, Phil Mickelson, Short Game. Bookmark the permalink.